Hemitomes congestum, the so-called Gnome Plant, is one of the rarest of the monotropoids--the group that includes Indian Pipe and the Snow Plant. You're lucky to see Hemitomes. It's rare, and it's small-only three or four cm tall when in flower. Sometimes it's pale pink in color. 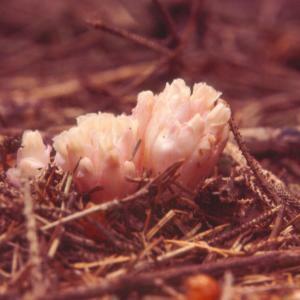 Return to the Hemitomes congestum page or the Parasitic Plant Index.